Piqua’s Qurri Tucker goes up for two points against Sidney Friday night at Garbry Gymnasium. Piqua’s Garrett Schrubb drives around Sidney’s Keith Lee Friday night. Piqua’s Zach Tillman takes a shot over Sidney’s Ratez Roberts Friday night. 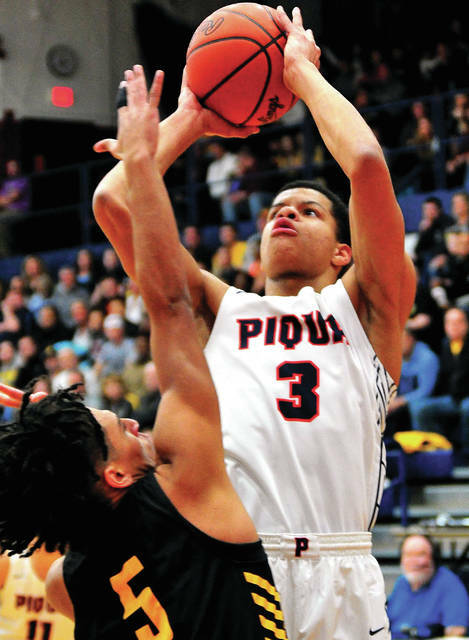 Piqua’s Trey Richmond shoots over Sidney’s Darren Taborn Friday night. Piqua’s Zack Lavey fires one in from long range against Sidney Friday night. 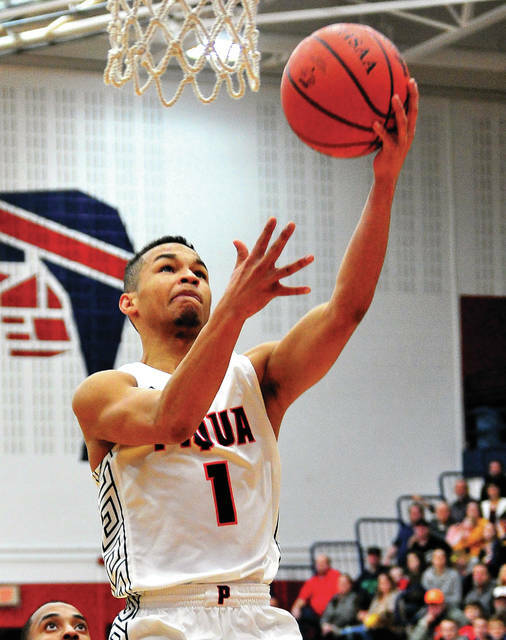 The Piqua boys basketball team stayed within striking distance for one half Friday night. But, Sidney opened things up and cruised to a 72-41 victory over the Indians in GWOC American action. Sidney improved to 17-3 overall and kept pace with Butler in the GWOC American Standings, sharing first with an 11-2 record. 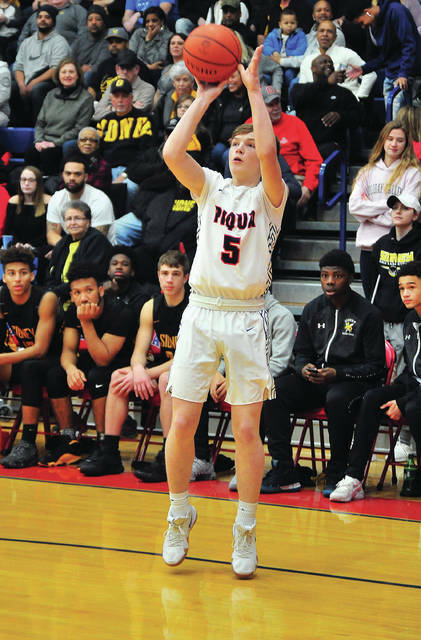 Piqua dropped to 6-14 overall and 3-10 in GWOC American play and will travel to Greenville Tuesday, before hosting Troy on Friday to close the regular season. With Qurri Tucker scoring six points early, Piqua had an 8-6 lead midway through the first quarter. A Trey Richmond basket tied it at 10 before Keith Lee and Ratez Roberts scored for Sidney to make it 14-10. After Mick Karn scored for Piqua, Andre Gordon answered for Sidney. Zack Lavey hit a long two-pointer for the Indians, before another Gordon basket made it 18-14 Sidney after one quarter. Sidney got the first four points of the second quarter on baskets by Dominick Durr and Lathan Jones, but Karn answered with a three to get Piqua back within 22-17. Gordon and Roberts came back with baskets for Sidney, before a Tucker free throws had Piqua within 26-18 with:01 remaining in the first quarter. Roberts scored three points and Jones had a putback as Sidney built its lead to 31-20. 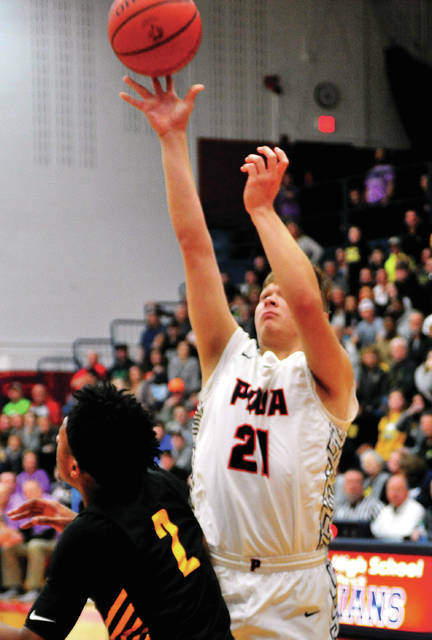 But, Tucker scored inside and Iverson Ventura hit an NBA three to get Piqua within 31-25, before Sidney scored the final points of the half to make it 33-25 at the break. But, it was Sidney in the second half. Gordon took over in the third quarter, outscoring Piqua 14-10 by himself without missing a shot as the Jackets opened a 56-35 lead after three quarters and cruised to victory from there. 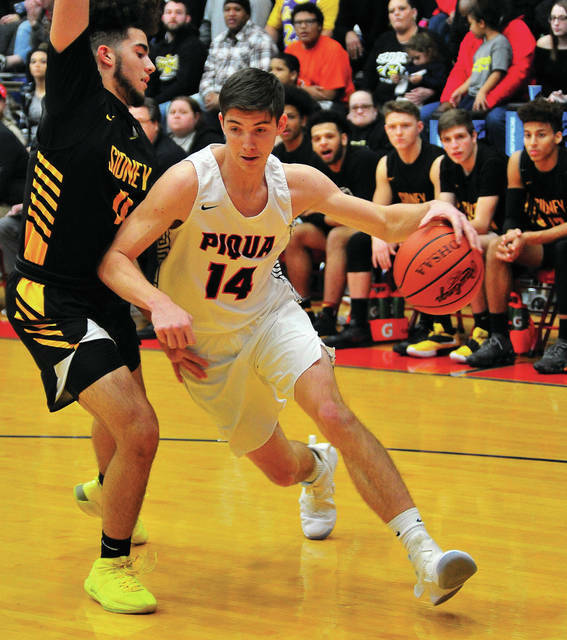 Tucker led Piqua with 15 points, while Karn netted 10. Both Garrett Schrubb and Kameron Darner pulled down six rebounds for the Indians. Gordon had a game-high 28 points, with six dunks and 13 of 16 shooting from the floor. Taborn and Jones both added 10 points and five rebounds for the Jackets. Piqua was 16 of 48 from the floor for 33 percent and five of 10 from the line for 50 percent. Sidney was 31 of 50 from the floor for 62 percent and eight of 13 from the line for 62 percent. Piqua won the battle of the boards 28-20, but had 16 turnovers to Sidney’s six. Ratez Roberts 3-2-8, Darren Taborn 4-2-10, Keith Lee 1-2-4, Andre Gordon 13-0-28, Josiah Hudgins 3-0-6, Dominick Durr 1-0-2, Lathan Jones 4-2-10, Trey Werntz 0-0-0, Jace Conrad 0-0-0, Darrius Boeke 0-0-0, Josh Harlett 2-0-4, Camden Vordemark 0-0-0. Totals: 31-8-72. Qurri Tucker 5-5-15, Kameron Darner 1-0-2, Trey Richmond 2-0-4, Mick Karn 4-0-10, Garrett Schrubb 1-0-2, Zach Tillman 0-0-0, Zack Lavey 1-0-2, Iverson Ventura 2-0-6, Riley Hill 0-0-0, Tanner Kemp 0-0-0, Caleb Lyons 0-0-0, Keegan Patton 0-0-0, Devon Sever 0-0-0. Totals: 16-5-42. 3-point field goals — Sidney: Gordon (2). Piqua: Karn (2), Ventura (2). Records: Sidney 17-3 (11-2), Piqua 6-14 (3-10). Reserve score: Sidney 51, Piqua 46.